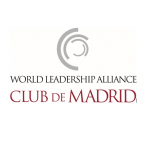 The Aurora Humanitarian Initiative, a non-profit charitable organization established on behalf of the survivors of the Armenian Genocide and in gratitude to their saviors, today announced a collaboration with the World Leadership Alliance Club de Madrid, the world’s largest independent forum of former heads of state and government. The collaboration, which began May 1, 2017, aims to inspire action to support those in need of humanitarian aid. 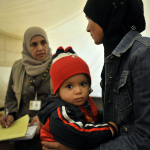 The International Rescue Committee (IRC) and 100 LIVES jointly announced a new partnership to fund a research program that will enable the IRC to provide vital assistance in the form of reliable and accountable cash distribution to those affected by the conflict in Syria. The International Center for Journalists (ICFJ), in partnership with the Aurora Prize, has named Rukmini Callimachi of The New York Times as the inaugural recipient of its Integrity in Journalism Award. She will receive the award for her exceptional contribution to exposing crimes against humanity during the inaugural ceremony of the Aurora Prize for Awakening Humanity on April 24 in Yerevan, Armenia. 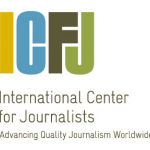 100 LIVES and the International Center for Journalists (ICFJ) announce the creation of an award to recognize courageous reporters who bring humanitarian crises to the world’s attention. 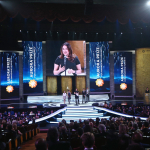 The ICFJ Award for Integrity in Journalism in partnership with the Aurora Prize,will be presented at a 100 LIVES ceremony on April 24 in Yerevan, Armenia. 100 LIVES is an organization that celebrates those who helped Armenians during the genocide one hundred years ago and supports people and organizations that keep the legacy of gratitude alive. 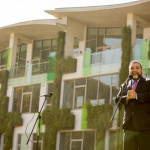 A new eight-year educational scholarship has been established to benefit one hundred at-risk children from the Arab Middle East. 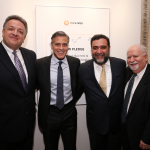 The 100 LIVES initiative announced the new program at the Near East Foundation’s Centennial Gala before an audience of humanitarian aid leaders and members of the Armenian community. 100 LIVES and NEF developed the program together as a way to express gratitude on behalf of the Armenian community to the people of the Middle East who offered shelter and food to refugees of the Armenian Genocide a century ago. 100 LIVES is pleased to announce the launch of a new annual scholarship established in partnership with esteemed international human rights lawyer Amal Clooney. The new ‘Amal Clooney Scholarship’ is part of an ongoing effort by 100 LIVES – the organization behind the Aurora Prize for Awakening Humanity – to strengthen cross-cultural education and understanding through collaborative social and philanthropic projects.